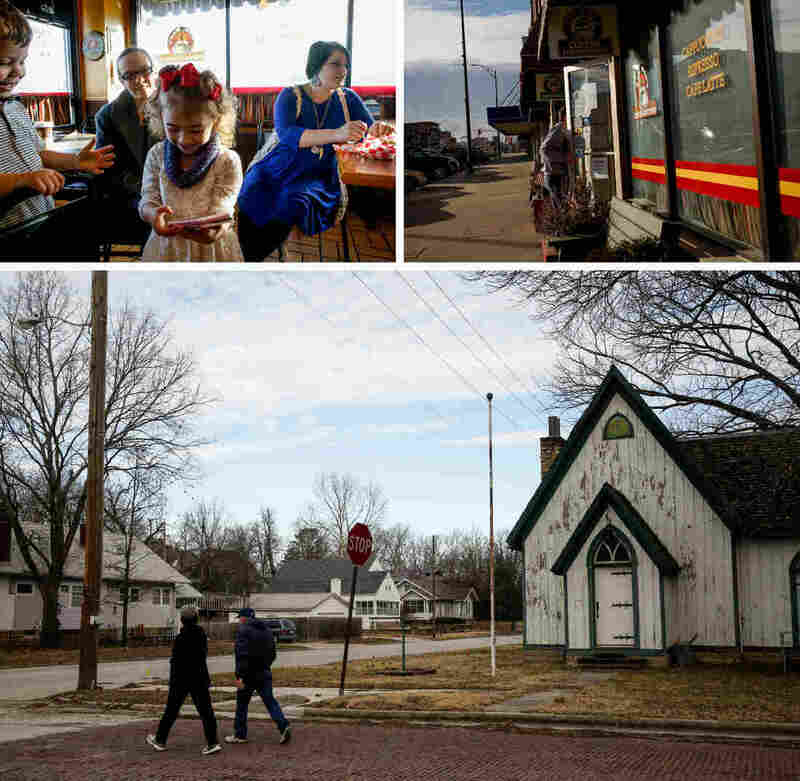 Despite Economic Troubles, Residents Of Kansas Town Remain Proud Independence, Kan., has a dwindling population. Many businesses have closed up shop and the city's hospital shut down in 2015. But the folks who live there remain proud of their town and its history. The main business street in town, North Pennsylvania Avenue, is lined with two-story brick buildings dating back to the early 20th century. 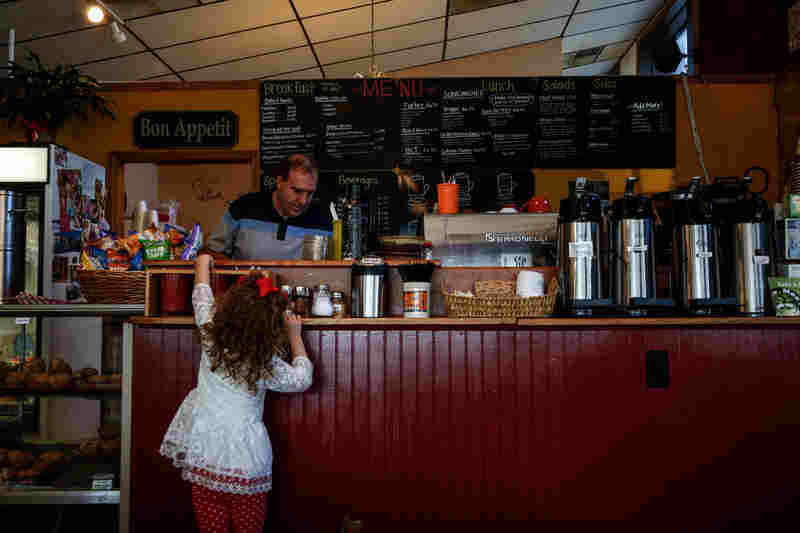 MaKinnley Craig, 4, reaches for a spoon at Ane Mae's, while shop owner Terry Trout works behind the counter. 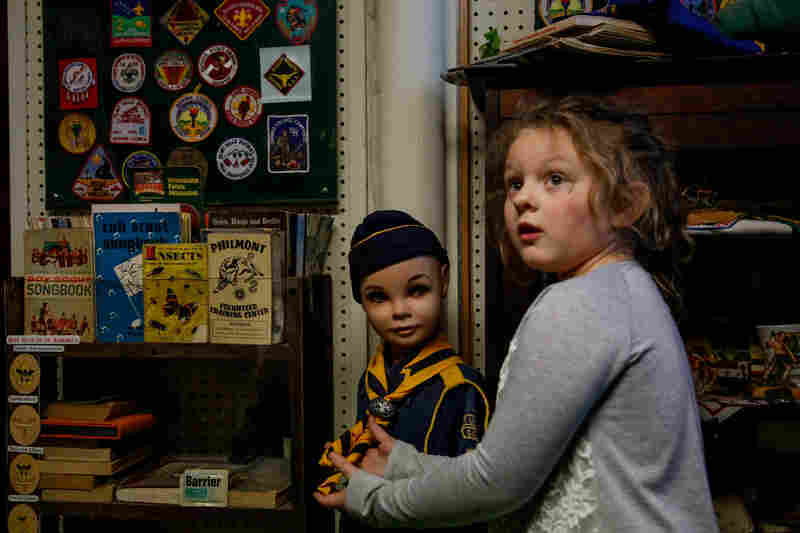 Esther, 6, explores the Scouting room at the Independence Historical Museum. Joy Barta is president of the Independence Historical Museum's board of directors. 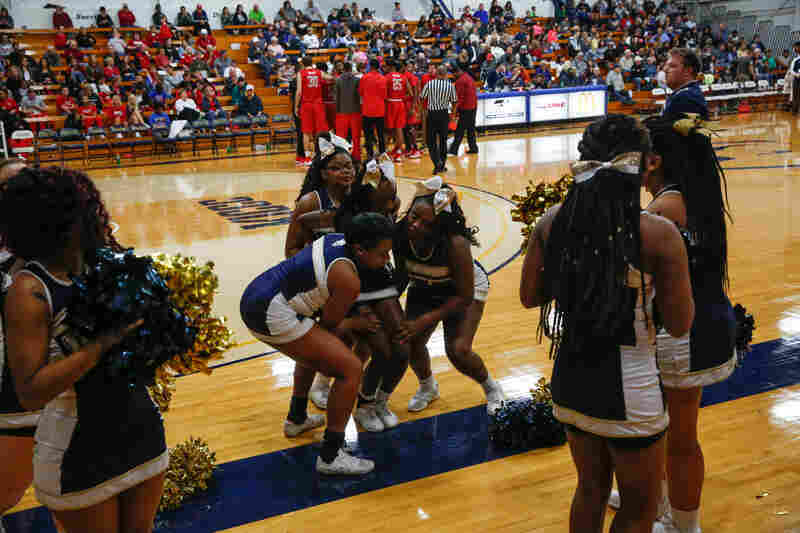 Cheerleaders during a timeout at the Saturday night community college basketball game. 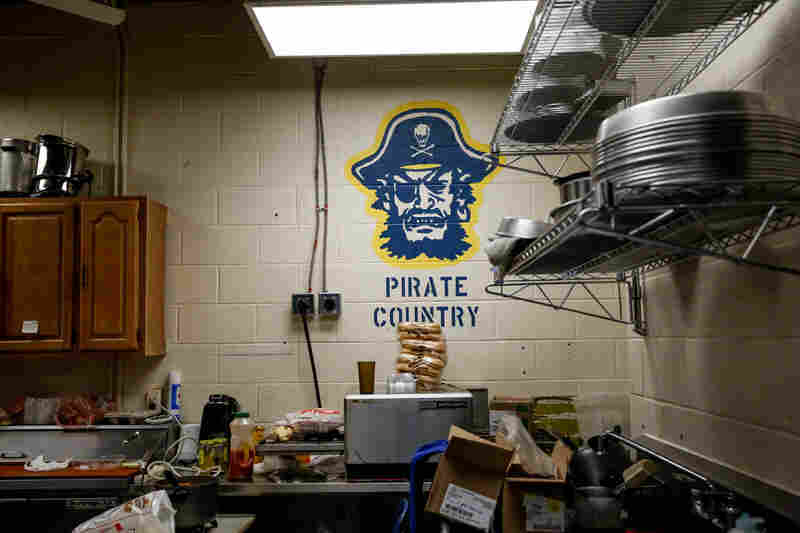 Behind the concession stand at the Independence Community College field house. 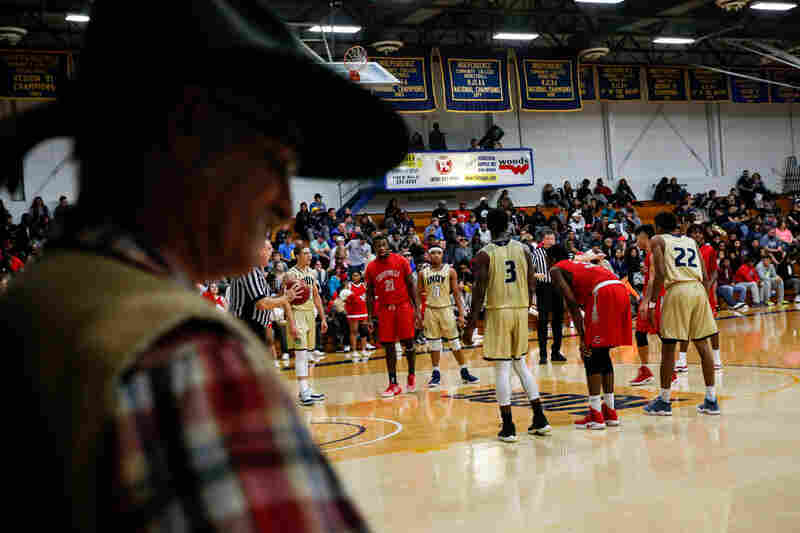 The Coffeyville Red Ravens go up for a free throw. 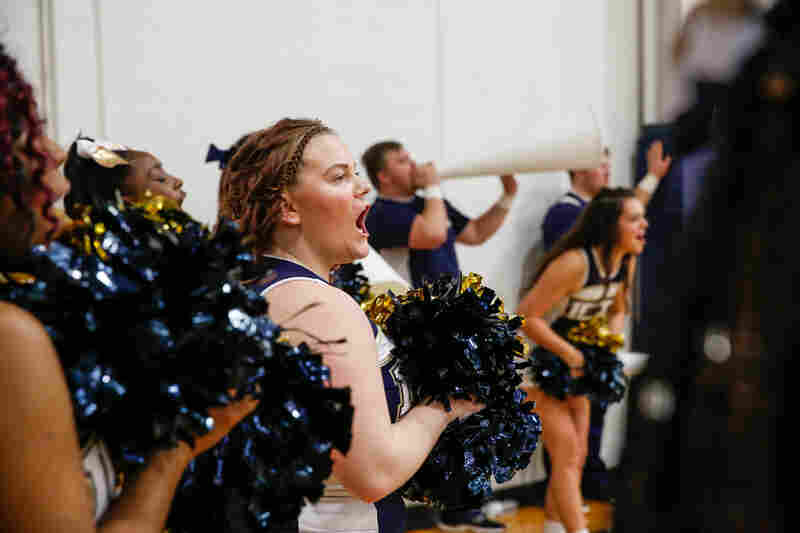 Cheerleaders encourage the Independence Community College Pirates as they play the Coffeyville Red Ravens. 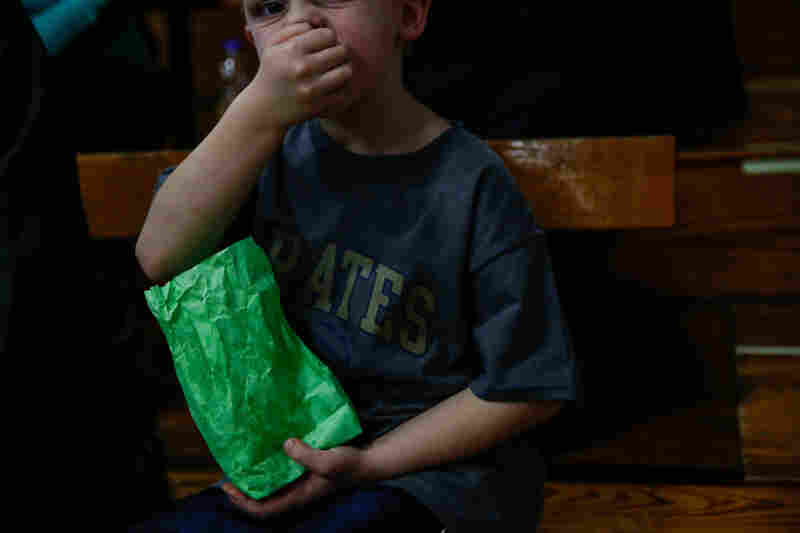 A young Independence Pirates fan grabs some grub at the game. A view of the town, near sunset. It's where Mickey Mantle played his first season of professional baseball, in 1949. It's the hometown of one of the first monkeys to be sent into space: Miss Able, in 1959. At its peak in the early 20th century, with oil and gas money fueling prosperity in Independence, it was said to have more millionaires per capita than any other city in the U.S.
Now, if you're from Independence, you still wear that name with pride. Just about everyone we talk to tells us it's a great place to raise children. People are especially proud of their annual Neewollah festival. It's Halloween spelled backward. Dating back to 1919, it's held every October and is said to be the oldest and largest festival in the state. They're proud to be the hometown of playwright and novelist William Inge, who wrote Bus Stop; Come Back, Little Sheba; and Picnic; set in small Midwestern towns much like Independence. Their hometown author is celebrated in the annual William Inge Theatre Festival, which has attracted marquee names like Steven Sondheim and Neil Simon as honorees. 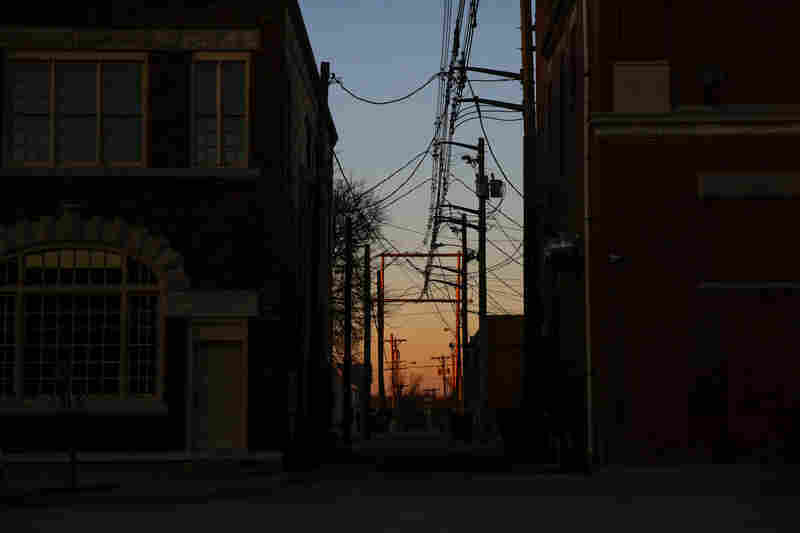 Big city folks plunked down in rural Kansas. "And then they marvel at cows, as you bring them back into town!" says Kym Kays, laughing. I find Kays and her early morning women's walking group chatting over cups of coffee at Ane Mae's coffee shop. They tell me that in a town like this, you tread carefully when talking politics. "We do express our opinions, but then we kind of back away politely," Sarah Wilson begins. "We are Kansas polite! We are a Kansas polite community!" adds Kays. "Good ol' Midwest," Sheri Hesse chimes in. "It's kind of like,'Yes, I feel this way, but I understand how you feel.' Because we're a small town, and we all have to get along," Wilson concludes. A couple of blocks away (most things in Independence are just a couple of blocks away), we stop in at the storefront office of the weekly Montgomery County Chronicle. It's a tiny operation. Editor Andy Taylor reports just about all of the stories himself and shoots photos. At 5 a.m. every Thursday, he's the guy who picks up the papers from the print shop and delivers them. If you get the Chronicle, chances are Taylor has touched your paper. He's a fifth generation Kansas newspaperman. "There's ink in the blood, that's for sure," he says. "And I still love going in the press room at night. Just getting that smell in your nose is wonderful." To get a sense of what Independence once was and is now, Taylor and his wife, Amy, lead us on a walking tour of the town. The main business street in town, North Pennsylvania Avenue, is lined with two-story brick buildings dating back to the early 20th century. Some buildings bear the family names that built this town's prosperity. They're carved in stone at the top: Pugh, Burns, Reynolds. "Growing up in this part of the country, this town was full of businesses," Taylor says. Now, the street is a shadow of what it once was. "For rent" signs are taped to storefront after storefront. Taylor points out what has disappeared. "We used to have a J.C. Penney department store over here. That's now gone," he says. 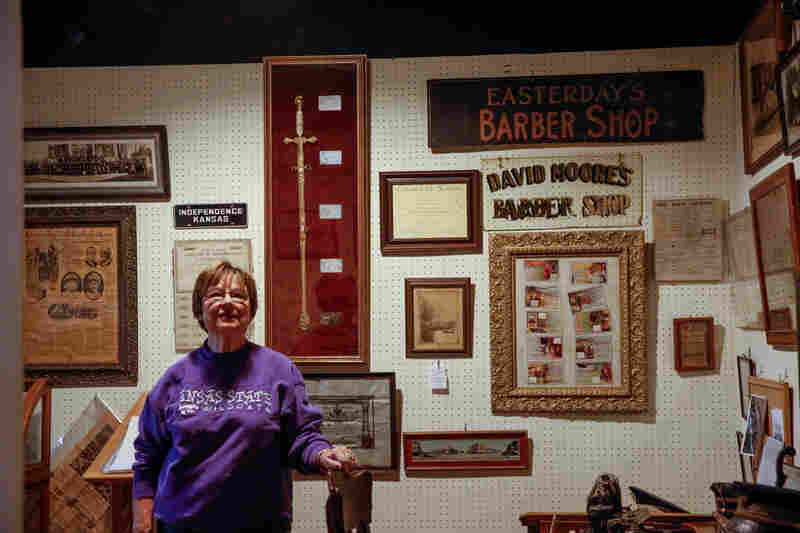 "We had a furniture store, Wesco furniture — it's gone. We had RadioShack, it occupied two storefronts — it's gone. A Hallmark store — it's gone. Sporting goods store — it's gone. We had a clothing store, department store — it's gone." But the biggest body blow came in October of 2015. 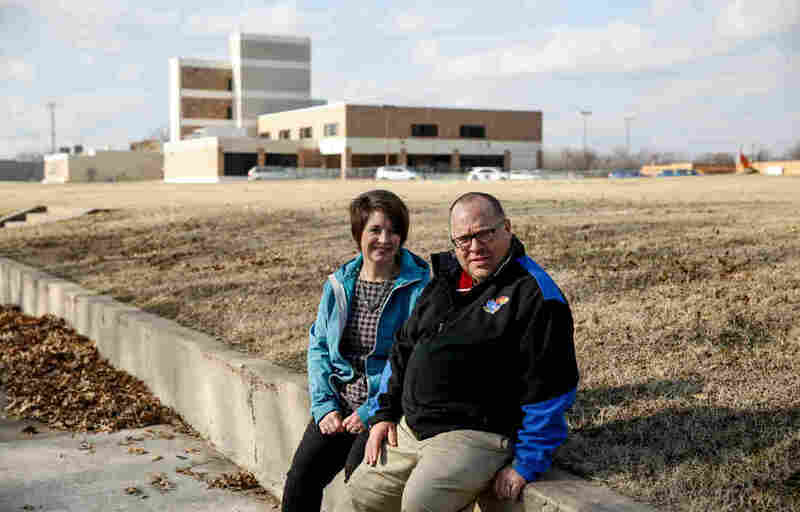 "We're the first town in Kansas in well over 25 years to lose a hospital," Taylor says. Mercy Hospital was confronting a shrinking patient base. "There weren't enough fannies in the hospital beds," as Taylor puts it. It had a hard time hanging on to doctors. Hospital officials said another key factor in the closure was Kansas' decision not to expand Medicaid under the Affordable Care Act. Taylor recalls the meeting where he heard the news that Mercy Hospital would be shutting down. "There were 18 mouths in that meeting, and they all dropped to the floor. 'You're closing down the hospital?' "
"It was a complete shock," Amy Taylor adds. "It's sad. That's where our daughter was born." "Not just that," Taylor says, "but it was a great, great company. And ugh, it still kills me." Right before the hospital closed its doors, the hospital staff asked Andy Taylor to take their picture one last time. "I literally cried when I looked through my viewfinder," he says, "because I knew most of those people. And I knew they were people who would be gone." The repercussions of the hospital closing are huge. "What happens at 3 in the morning?" Taylor asks. "What if you're a local company or industry and your worker at the midnight shift breaks his fingers or gets them mangled. Or you're in a car wreck. What do you do? Wow. Your answer is, you better hope your ambulance has a lot of gas in it." Mercy Hospital — as well as the oil pipeline company, Arco, which shut down its headquarters here in the 1990s — were major pillars supporting the community. Philanthropy flowed through them. They sponsored events. Pumped money into schools and churches. Walking past the old six-story Arco building, Taylor says: "Their payroll was huge in this community. The nicer houses that were built and the banks that loaned the money — it was all interrelated. Anything that worked for the good of Independence came from places like this. "Now, we've just relegated ourselves to becoming a satellite town for some other community," he continues. "That means migration out. I never thought I'd see the day when Independence, Kan., would see people having to go elsewhere to get their basic services." Now that many of those high-paying, professional positions have vanished, Taylor says, "We've evolved downwardly, I guess. Backwards." According to Taylor, nothing has come in to replace those jobs. "Once all that old money dies off and leaves town, that really hurts," Taylor explains. "There's that old theory that when grandma and grandpa die, the funeral is at 2 o'clock, the family is at the bank at 3 o'clock, and they're out of town with that money at 4 o'clock. And I've seen that happen many times." 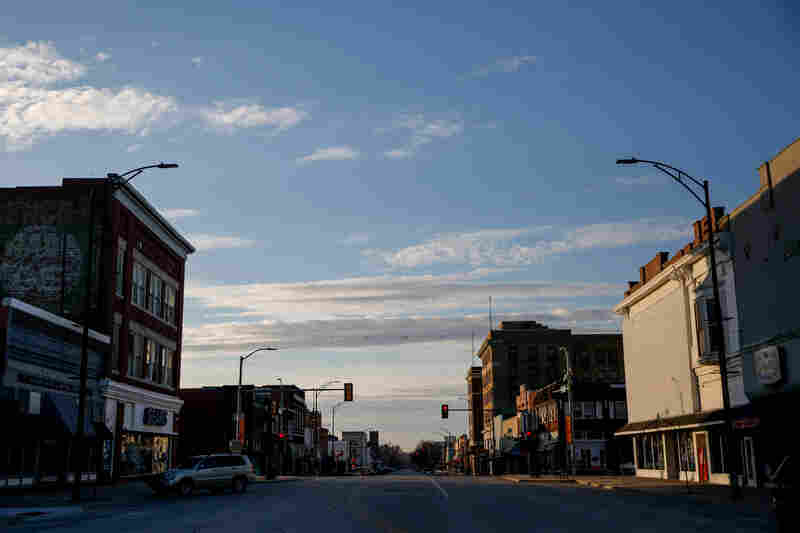 That's a problem facing so many rural towns where opportunities are slim: brain drain. The best and brightest leave and don't look back. 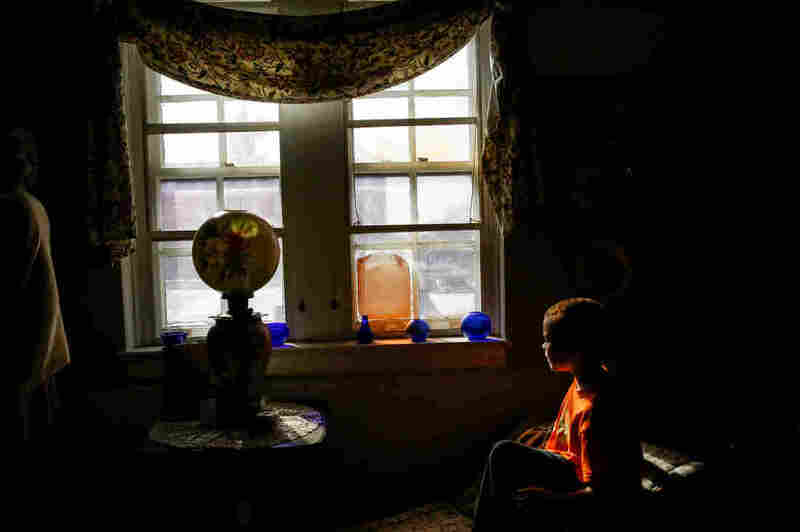 For Independence to thrive, I figure it has to find a way to hang on to kids like sixth-grader Gabe Schenk, age 12. 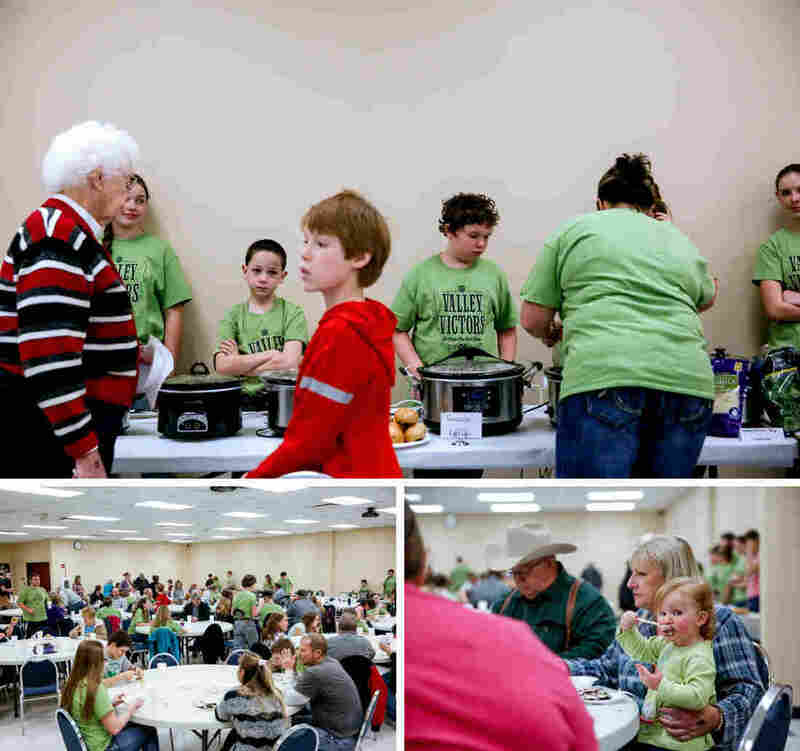 I meet him at the Valley Victors 4-H Club's annual soup supper: 32 crockpots, all in a row. Gabe promises me that his crockpot holds the best homemade taco soup, and it is indeed delicious. The secret to cooking, Gabe tells me? You have to talk to your food. 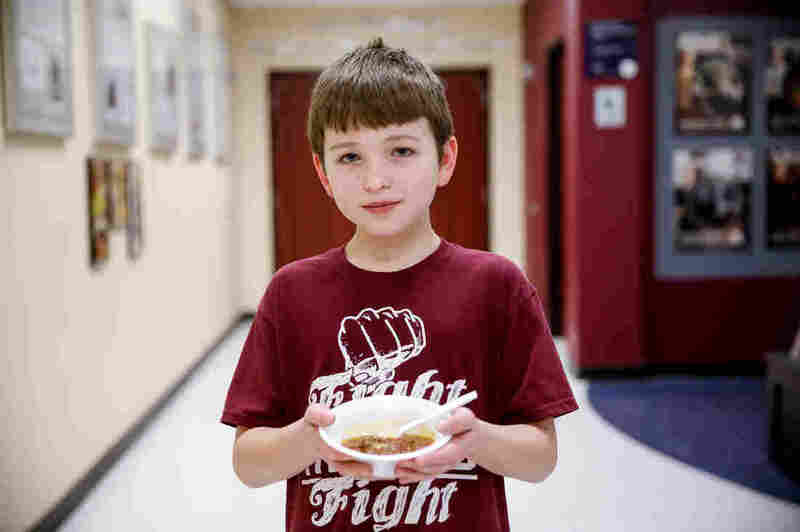 "I had a very long philosophical talk to the chili," he says, straight-faced. "What is the meaning of a chili's life?" And did the chili answer? "He's the strong silent type." Gabe tells me his dream is to be a storm chaser or meteorologist. When he was younger, a tornado came through and ripped the roof off his house. He recalls that the sky that morning was a really cool green color. "And I thought it was kinda like scary, but then amazing at the same time," he says. "If I'm going to study the big storms, this is the place to be!"